Archaeologic Before Sinclair Research and the QL, the Spectrum and the ZX81, before even Sinclair Computers and the ZX80, there was Science of Cambridge and the MK14 microprocessor kit. Released in February 1978 - that’s when the first adverts for the mail-order-only offering appeared, at least - the MK14 entered the SoC pipeline late in the Summer of 1977, thanks to the National Semiconductor company. But it wasn’t the first computer kit SoC manager Chris Curry planned to bring to market. And the notion of offering a very low-cost build-it-yourself training tool for engineers and enthusiasts eager to get to grips with the new silicon chip technology was not his. It was the brainchild of a 27-year-old electronics engineer who soon turned his back on the nascent computer business and went on to become a captain of industry. His name was Ian Williamson and by 1977 he knew as much about the inner workings and uses of microprocessors as anyone in Britain. As a young electronics engineer working for technology hot-house Cambridge Consultants Ltd (CCL), it was Williamson's job to “think the unthinkable and then find someone who wanted that solved”, as he puts it. As a member of CCL’s Digital Systems Group, he had already tried to interest companies in the then groundbreaking idea of creating arcade video games based on microprocessor technology. But in the mid-1970s no one in the UK was willing to take a chance on the computerised slot-machines that were changing the way teenagers got their kicks. Silicon chips were too novel for established electronics companies, and it seemed they did not fully grasp their potential. But Ian knew that their engineers, not to mention electronics enthusiasts, really wanted to understand what silicon chips could achieve, and that meant first teaching them what how they worked and how they were used. He decided here was a market he could exploit, with a combination of a simple, low-cost microprocessor kit and a step-by-step guide explaining how it worked. “What I could see was this incredible thirst for knowledge about microprocessors,” Williamson tells The Register. “Certainly anyone who was an electronics engineer felt threatened by the technology and wanted to learn about it. "The UK also had a well-established electronics hobby sector and there was incredible interest in what the technology could do. But it was very expensive technology to play with. And you couldn’t just buy a chip, you needed everything that went with it to program it. 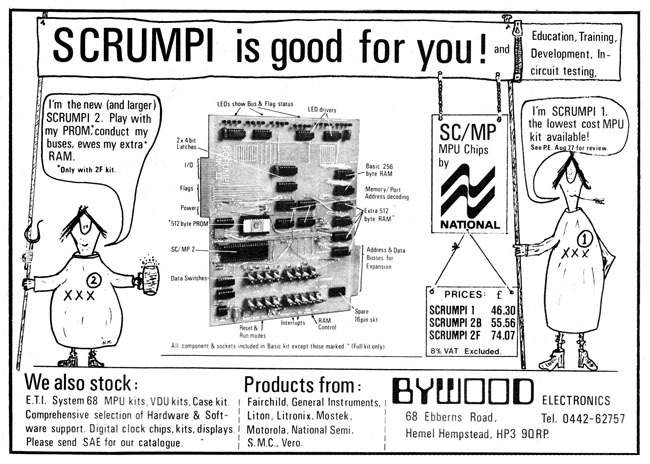 It was the same notion that had prompted Bywood Electronics’ John Miller-Kirkpatrick to devise the crude Scrumpi computer and bring it to market at the end of 1976. Scrumpi cost around £56, right in the centre of the £50-£60 price range within which Williamson felt he needed to place his own offering. But the computer lacked the numeric keypad and display of the more expensive kits on sale and relied instead on physical switches for data input and used a series of LED bulbs to present the results of calculations. Like Miller-Kirkpatrick, Ian Williamson understood there was a untapped market for a low-cost introduction to the microprocessor, and he was driven by the same entrepreneurial zeal to sell one. In Williamson’s case, that had been instilled early on by his employer, the famous CCL. Williamson joined CCL in 1974. The company was founded in 1960 by three Cambridge graduates – Rodney Dale, David Southward and the late Tim Eiloart – to “put the brains of Cambridge University at disposal of the problems of British industry”. By the time Williamson arrived, CCL had become one of UK’s most influential independent R&D houses. Its formidable reputation was built on hiring bright, capable and driven engineers and scientists – either straight out of Cambridge University or, like Williamson, from the pool of Cambridge graduates who had established careers in industry. In Williamson's case, that meant a five-year apprenticeship with GEC’s Marconi Space and Defence Systems in Stanmore, Middlesex. Williamson went in as a 17-year-old school leaver. It put him through university, where he studied electronics and engineering at Christ’s College, Cambridge, and he returned there after graduation to develop digital control systems for satellite ground stations. The trouble was, after university, Ian became “really uncomfortable with the pure defence focus of the work” at GEC-Marconi. CCL was no mere think-tank. It was at the heart of what would become known in the 1980s as Silicon Fen, home to almost all of Britain’s most dynamic technology startups. CCL was a thoroughly commercial operation and it encouraged its engineers to think entrepreneuriallly. Workers at other companies could rely on being told what to do by their managers, but CCL’s smart young things were expected to come up with ideas and work themselves - and to go out and sell their notions to potential clients. That was easy for a sales rep with a charming manner and a glib tongue, but to be able to pitch successfully, an engineer or scientist needs not only a high degree of technical competence but also a deep belief in the concept being sold. That inevitably caused some to consider cutting out the client and doing it themselves. CCL co-founder Tim Eiloart, for instance, had established Cambridge Learning Enterprises to produce and publish self-instruction guides on technology topics. 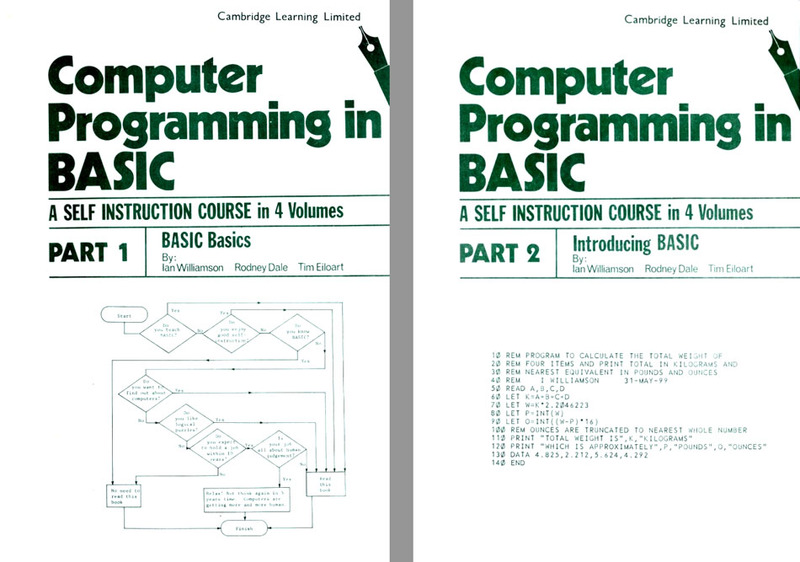 Ian Williamson had already penned one of these on digital electronics, Microprocessors and microelectronics: a self-instruction course from Cambridge Learning. This emphasis on education and training shaped Williamson's conception of what his low-cost kit could achieve. He wasn’t setting out to make a cheap general-purpose computer but a simple system to give people a chance to learn about the new microprocessor technology. The first step: build a prototype. The National Semiconductor SC/MP processor, aka the "Scamp", was the obvious choice for a low-cost kit since it was readily available and rather cheaper than rival offerings. It was unsophisticated and easy to learn to code. Memory was easy to buy too; 256 bytes would be sufficient. But what about the display and the keyboard? 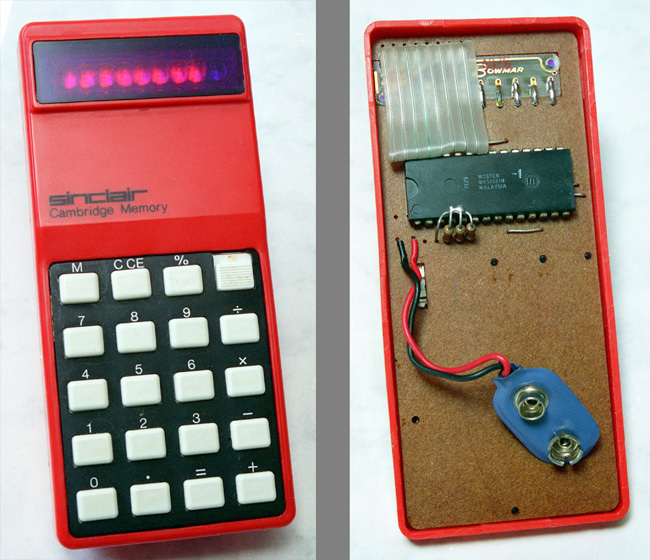 Ian reasoned that an ordinary calculator might prove a cheap source of a keypad and an eight-digit LED display, so he bought himself a Sinclair Cambridge calculator, took it apart and examined the components. Hooking up the input and output pins on the Cambridge’s main chip to an oscilloscope, he quickly worked out how the device read and interpreted a button pressed on the keypad and how it presented numbers on the display. With that information, he wrote a 512-byte program to allow users to key in their own program instructions on the calculator’s numeric keys and run them on the kit’s SC/MP processor. For the tutorial he wrote a small set of simple “noddy” programs that users could type in to see the machine at work. There was a broad template for this: National Semiconductor itself offered a low-cost SC/MP evaluation board called the Introkit for around the same price as Miller-Kirkpatrick’s Scrumpi, but which was designed to be hooked up to a teletype. However, as an alternative method of input and display, the IntroKit could make use of what National Semiconductor called the KBDKit, which was essentially a pocket calculator repurposed as an input device and screen. Using the Cambridge parts put some limits on what Williamson’s own machine could do. Microprocessors were then typically programmed by feeding them instructions and data as pairs of numbers written in hexadecimal notation: the two-digit hexadecimal "machine codes" used to represent each of those instructions. 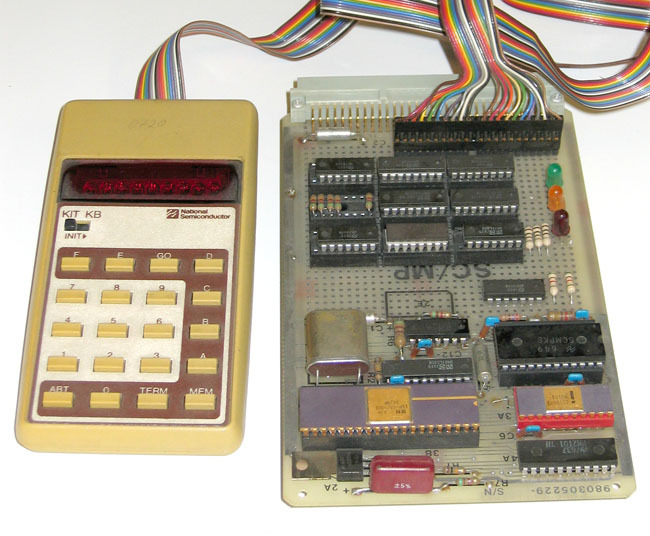 Unfortunately, the Cambridge calculator chip – which Ian decided could be put to work monitoring the keypad and controlling the display electronics – could only output numbers. It could easily present any single digit from 0 through 9 but not the letters A to F. That ruled out being able to display hexadecimal numbers. So he employed a different notation: octal, which only uses the digits 0 to 7. He adds: “The calculator chip was driving the digits. I interrupted the IO of the calculator chip so when the Scamp kit wanted to display something, it just sent eight digits to the calculator. I just drove an eight-digit value into the register. Williamson still has the prototype. It has the kit’s key chips: the SC/MP processor, the 256 bytes of RAM and 512 bytes of ROM, all connected by wires rather the fine, etched metal lines of a finished product’s PCB. Between the time Ian Williamson started working on his microprocessor kit project, in the spring of 1977, and July of the same year, he applied for and was offered a job at nationalised car firm British Leyland’s buses, trucks and tractors division, Leyland Vehicles. The firm was based in Preston, Lancashire, but he had the chance to become the firm’s Principal Electronics Engineer. Three years previously he had quit GEC-Marconi to escape the morally questionable world of defence work, but even in Cambridge he found himself being dragged back into defence work. “I had this idealistic notion that in the real world you help people with real jobs,” he says. 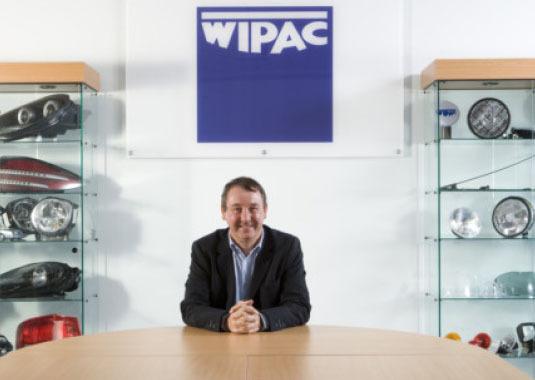 Accepting the job offer from Leyland Vehicles would allow him to do just that, but it was nonetheless a very big career change involving a move far away from friends and colleagues, and from the buzz of the being at heart of Britain’s technology sector. “I weighed it up and I decided to do it,” he says. Having accepted the Leyland offer, the engineer realised he would now no longer be able to establish a microprocessor kit sales business. Yet he was unwilling to simply shelve the project and chalk it up to experience. He could still make it pay, if he could sell the device and documentation to a third party with the resources to offer the kit as a commercial product. At the start of the development process, Williamson had sounded out his CCL bosses to see if the firm was interested in commercialising the kit, but they weren’t keen. Now, during August 1977, while he worked out his notice period, he approached two other companies in the Cambridge area who might have the imagination and expertise to bring his product to market. One was a maker of electronic instrumentation and simple kits for enthusiasts, but it proved no more receptive to Ian’s ideas than CCL had been. The other was Sinclair Radionics. It was an obvious choice. Radionics had, after all, made the calculator he had used for parts. There were also very close ties between CCL and Radionics: Sinclair’s office in St Ives, a town just north of Cambridge, was situated in a building, The Mill, which was owned by CCL. Rather a lot of Radionics’ employees had been lured away from the technology consultancy, among them co-founders David Southward and Rodney Dale. And Ian had a special way in: a few years before, when he had been looking for a way out for GEC-Marconi, he had turned down an offer of a job at Radionics. He had declined the chance to become an engineer at the company offered by none other than its founder, Clive Marles Sinclair. Radionics was not, however, Sinclair’s only business. Three years previously, in September 1973, CM had acquired a company called Ablesdeal Ltd - and not, as has been written many times since, Ableseal. Quite why Sinclair bought Ablesdeal isn’t known, but it gave him a ready registered company he could establish quickly and cheaply at any time. Some 16 months later, on 15 January 1975, Sinclair changed Ablesdeal’s name to Westminster Mail Order Ltd. The move was formally recorded the following month. On 9 June 1976, he changed its name again, this time to Sinclair Instruments Ltd, at the very time the troubled Radionics was seeking financial assistance from the British government. On 17 June 1977, Clive Sinclair, listed on the name-change form as Sinclair Instruments’ chairman, renamed the company Science of Cambridge Ltd. Sinclair would change the name of the company two more times: first on 15 October 1980, to Sinclair Computers Ltd, and then on 2 January 1981, to Sinclair Research Ltd, the name by which it would be forever remembered.